Last week AFCEA International unveiled plans for a new mentorship program titled The Mentoring Continuum. The group will have its first meeting October 2013. 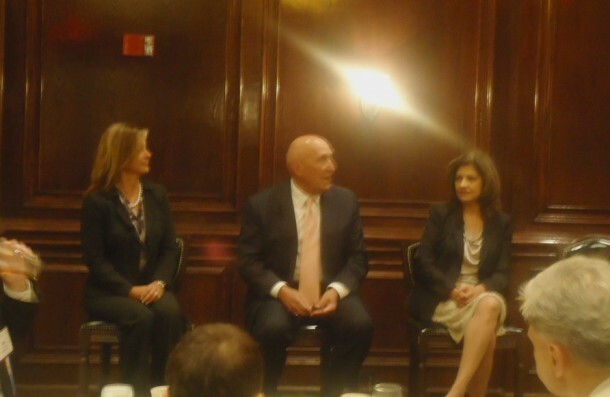 Kay Kapoor, President at AT&T Government Solutions, and Renny DiPentima, former President and CEO at SRA International (SRA), lead the kickoff luncheon at Maggiano’s in Tysons II to discuss the benefits of having mentors throughout a career and the importance of building a network of trusted relationships. Renny DiPentima, was Kay Kapoor’s former Adjunct Professor at the University of Maryland early on in her career. The two lost touch for a number of years, but have since reconnected and continue to have a strong relationship as mentor and mentee. “My inventory went home with me every day,” DiPentima said, when discussing his time as CEO of SRA. Michelle Richards, Director at AT&T, is a mentee of Kay Kapoor. The panelists concluded that professional mentorship is a give and take process that requires ownership by both parties. The mentor and mentee connection is a practical and structured relationship that requires personal commitment and engagement.